He made the remarks in a speech published by the Jaish al-Sha’ab (People’s Army) magazine on Wednesday in commemoration of the 73rd anniversary of the founding of the national Syrian military. “They (the terrorists) were ultimately forced to leave — humiliated, rolled back, their tails between their legs — after you gave them a taste of bitter defeat,” he added. In recent weeks, the Syrian army has been trying to wrest control over the southern provinces of Dara’a and Quneitra, which border the Israeli-occupied Golan Heights. Takfiri militants have been handing over their heavy weapons to Syrian government forces and leaving the region in negotiated surrender deals. The full liberation of both Dara’a and Quneitra by Syrian government forces would cut the much-reported collaboration between Israel and anti-Damascus militants operating in the two regions. 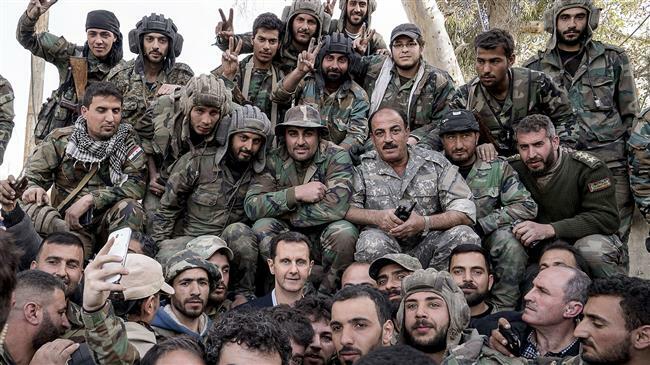 Recently, President Assad told Russian media that Damascus’ next priority would be retaking the northwestern Idlib Province, which is mostly held by terrorists. The data was added on ,	1 August 2018 viewed 508 times. VIDEO: Lebane MP clarifies US-israel, KSA, Qatar, Turkey consorsium’s plots which make Mideast bath in blood!